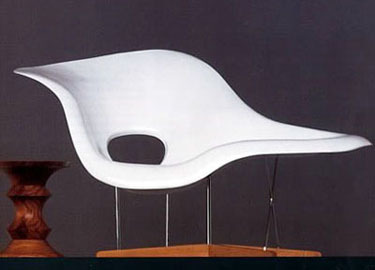 A modern seating sculputure: the Charles & Ray Eames La Chaise. "La Chaise" attracted much attention at the "Low- Cost Furniture Design" competition organized in 1948, by the New York Museum of Modern Art. The shape of the shell evokes elements found in paintings by Salvador Dali and works by sculptor Gaston Lachaise, after which it was named. The voluptuous organic Eames La Chaise chair is produced by Vitra in Germany.